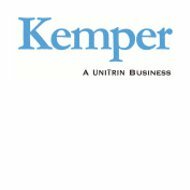 Unitrin Insurance Company is part of Kemper Insurance Corporation. The Unitrin name is used to underwrite automobile and homeowner’s insurance. However, the health insurance division is marketed under the Kemper name. Compare health insurance rates from active providers by entering your zip code into the toolbox now! Kemper Corporation offers health insurance to individuals, families, and small businesses. However, the website does not explain these products in detail. Kemper Corporation Agents are independent agents and company employed agents. There are 275 independent agents and 2,600 Kemper employed agents. These agents sell life and health insurance to consumers. If you are interested in representing Kemper as an independent agent, simply fill out the information online and submit. Opportunities in your area will populate the screen. You can then contact the division of Kemper listed to determine how to market the products in your area. Kemper independent agents can meet with you in person to discuss your individual insurance needs. To find an agent or office nearest you, input your zip code into the toolbox on the Kemper website. The address and phone number of the nearest office will populate your screen. Interested policyholders can obtain a Kemper quote by inputting your zip code, method of how you would prefer to shop for insurance, and type of insurance you need. Once this is complete, the insurance brand that you are eligible for, in the state you reside, will populate the screen. An overview of the insurance brand is also available for your review. Next, you can click on the insurance brand link to obtain additional information including the actual quote. However, you will undergo further questioning on the insurance brand’s website to see a quote. If you would prefer to not go through all of these steps, you can contact a sales representative. United Insurance has been in the insurance business since 1919 servicing all states with the exception of New York, New Jersey, and Virginia. United Insurance offers health and accident insurance. The policies are known as First Occurrence policies, which provide lump sum benefits upon the occurrence of heart attacks and cancer. There are also accidental death and dismemberment policies that cover life-changing accidents. To obtain additional information on these policies, contact a United Insurance representative at (800) 777-8467. Reliable Life Insurance also offers health and accident insurance. The policies are the same as United’s First Occurrence policies, which provide lump sum benefits upon the occurrence of heart attacks and cancer. There are also accidental death and dismemberment policies that cover life-changing accidents. To obtain additional information on these policies, contact a Reliable Life Insurance representative at (800) 777-8467. Union National Life Insurance also offers health and accident insurance. The policies are the same as United’s First Occurrence policies, which provide lump sum benefits upon the occurrence of heart attacks and cancer. There are also accidental death and dismemberment policies that cover life-changing accidents. To obtain additional information on these policies, contact a Union National Life Insurance representative at (800) 777-8467. Mutual Savings Life Insurance also offers health and accident insurance. The policies are the same as United’s First Occurrence policies, which provide lump sum benefits upon the occurrence of heart attacks and cancer. There are also accidental death and dismemberment policies that cover life-changing accidents. To obtain additional information on these policies, contact a Mutual Savings Life Insurance representative at (800) 777-8467. Find insurance companies in your area by entering your zip code now to compare health insurance rates!